Don’t you hate it when you’re about to sit down to dinner with your family and all of a sudden you get a phone call? I certainly do, doesn’t matter who it is, because when it time to eat in my house, it’s time to eat. Disgustingly large fast food lasagnas aside, phone interruptions are the worst when you’re about to do something. The only thing worst is when the person on the other end of the phone is trying to sell you a Rascal Scooter. Stupid Rascal salespeople, don’t they know that I already own a decked out Hoveround so that I can get around in style without touching the floor or using my legs, ever. Seriously though, I absolutely hate telemarketing calls. They were the bane of my existence all throughout the 90s where they seemed to be at their peak and ringing my house phone endlessly. That’s why I was so glad when the National Do Not Call Registry was passed into law because the rest of the world and I finally got a reprieve from the endless harassment. Or so we thought. In case you’re not an avid follower of telemarketing related news like I am, you might’ve missed the latest scandal mentioned in the opening paragraph. Mobility Electric, the manufacturer of the Rascal mobility scooter, was recently fined by the Federal Trade Commission for violating the National Do Not Call Registry laws. The company was ordered to pay $100,000 for making over 3 million telemarketing phone calls in 2003. Mobility Electric made the calls to people who had filled out the company’s sweepstakes forms. Mobility Electric claimed that because the customers had filled out the contest forms, this was sufficient to establish a “business relationship” with each customer and therefore their phone calls fell within an exception to the law. However, according to the FTC under the Do Not Call rules, this act is not enough to qualify for the business relationship exception. Though the unwarranted telemarketing calls are bad enough, I think the most troubling aspect of this story is that the majority of consumers being called are elderly people. The notion of this more vulnerable demographic being targeted for market simply doesn’t sit well with me. In any case, the Do Not Call laws could not be more clear: a company cannot solicit business out of you over the telephone simply because you happen to fill out one of their promotional forms. In order for a business to qualify for the business relationship exception, they needed to have actually done business with you. This means you need to have actually purchase a product or service from that company. And even if your relationship with a company falls into this category, should you request that they put you on their Do Not Call list, that company must honor your request regardless of how much business you do with them. But what happens if a company continues to contact you even after you tell them stop? Well, in addition to the company becoming subject to criminal prosecution from the federal government, the Do Not Call laws also allow private legal rights of action. This means that you can actually sue a company that continues to contact you after you’ve told them to stop and win a fixed damages award. Of course there are exceptions to this rule. Charities, political campaigning organizations, and not-for-profit research-based survey phone calls are all exempted from the Do Not Call laws. These groups can call with impunity because they have been deemed to serve a greater public service, as annoying as they may be. 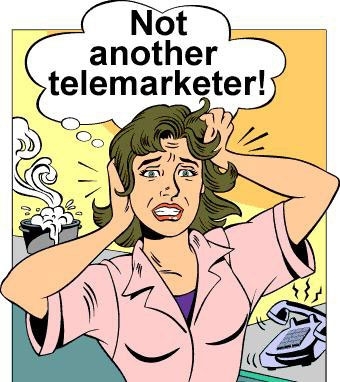 So what should you do if you’re getting unwanted telemarketers hounding your phone? The best thing to do is to get their company’s information and then tell them to put you on their Do Not Call list. And if they call back, be sure to break out your audio recorder and catch every bit of the conservation. In case you need to sue privately, you’re going to need it to build a good open and shut case.